Help your guests find their seats at the Seder table easily this Passover! 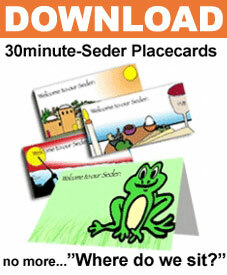 These beautiful full-color placecards are sure to be a hit at your Seder Table! Use them at the table or you can mail them as Passover cards or invites. Instantly download these full-color placecards-just print, cut, and fold!